Our stunning solid oak fabric dining chairs are upholstered in a variety of eye-catching prints, and can really give your dining space an extra touch of class. Each chair is built using premium fabrics and the very best cuts of solid oak and mango hardwood, carefully chosen for their superior grain patterns and colour. 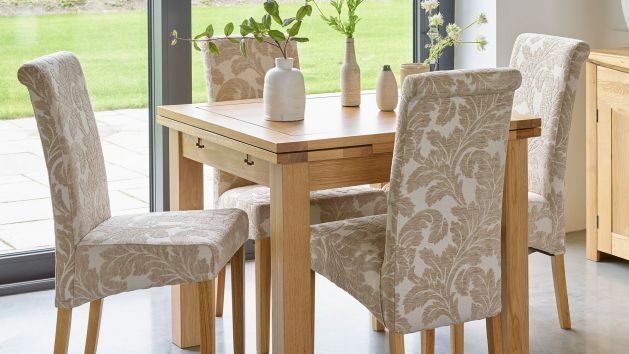 Quality comes first at Oak Furniture Land, which is why each of our fabric dining chairs is built without inferior materials, such as MDF or veneers, ensuring they can be enjoyed in your home for years to come. Fabric dining chairs can dramatically change the look and feel of your dining space, which is why choosing a design that suits you and your home is key. For example, an elegant floral print beige fabric chair really works with traditional, opulent dining rooms that feature lots of light colours and ornate lamps and accessories. Our charcoal fabric dining chair looks fantastic in more contemporary spaces with darker colour tones, such as various shades of black and grey. Our checked brown fabric dining chair blends well in farmhouse style dining space with lots of woods, natural colour tones, and lush green plants. Whichever fabric dining chairs you choose, you can select from a wide range of dining tables to pair with them. If you’re a little stuck for inspiration, our dining set builder is designed to help you find your dream dining combination. Don’t forget we also sell complete sets of dining table and chairs, as well as leather chairs by themselves. All our fabric dining chairs are upholstered in high-quality material, designed to withstand daily wear and tear for years to come, however some extra care can prolong their life considerably. A fabric care kit which includes a mild cleanser, stain removers, and a fabric deodoriser are recommended to keep your dining chairs in tip-top condition. Purchase your beautiful oak fabric dining chair set with peace of mind that you can enjoy free home delivery to the room of your choice; we’ll even give you a call 30 minutes before we arrive. For purchases over £500, we can also offer flexible monthly payments for up to four years. Take a look at our full range of flexible payment options online.